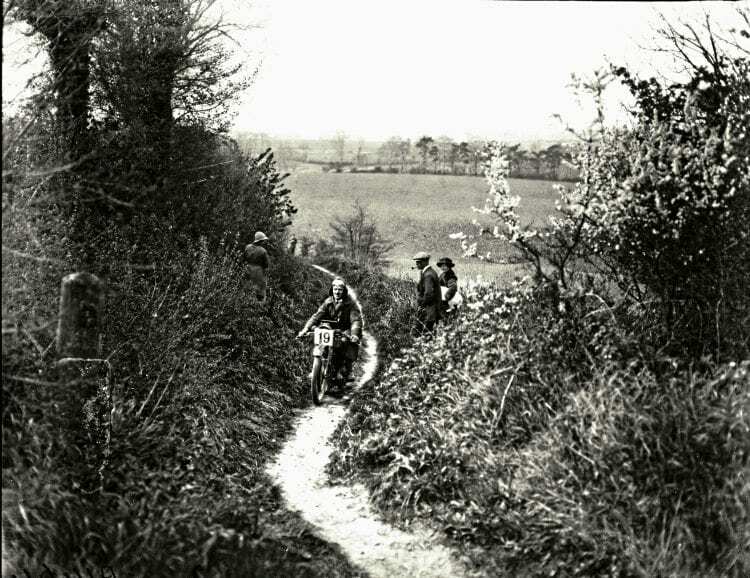 Despite the flatness of the land, a tough route was devised by the Ipswich and district MCC for its April trial. In fact, the course was so tough that it did for nearly 50 per cent of the entrants, as 20 of the 43 competitors were forced to give it up. A G Mann (Sunbeam) on a narrow track, typical of all the colonial sections. Only one, E C Lunniss (Matchless sc) achieved maximum marks; in fact, it was a good day for the Woolwich maker as A V Adams was the best of the 350cc entrants, with F K Portway and E T Elliot second and third in the unlimited sidecar class, behind Lunniss. Although, as The Motor Cycle pointed, this event was the preserve of bona-fide private entries; at least, that’s what the majority were. Best solo rider was Ipswich rider A G Mann, in the unlimited solo class, on a Sunbeam. As there was 600cc class (won by R G Smith, Triumph) and 500cc class (E C Rose, on a Sunbeam, won that) one can assume that Mann was riding one of the scarce V-twin Sunbeams, with a JAP V-twin engine. In class, he wasn’t that far ahead of R W Fison (Martinsyde) also from Ipswich – Fison being a well-known Ipswich name, owing to the fertiliser company called that. Fison made second best performance overall. Though that is conflicted somewhat by The Motor Cycle saying Mann was riding a 492cc Sunbeam, though both journals have him listed in the Unlimited category results. Further confusion is added by E C Rose being listed as best solo, despite Mann’s score being better. Whatever make and model, what is sure is a Sunbeam was the best of the solos on the day.